Early this summer I got the chance to visit the High Line in New York City. What’s the High Line you ask? That question can be answered by reading one of my favorite Picture books, The Curious Garden by Peter Brown. If you haven’t read it then you should stop reading this blog right now, buy it and read it, I’ll wait……. Actually you could be a very slow reader and I have things to do so I will summarize. The Curious Garden is a wonderful story, filled with fantastic illustrations, about a boy who lives in a smog filled grey city lacking any type of vegetation. Then one day he stumbles upon an elevated railway where he finds, of all things, a garden in desperate need of a gardener. So he takes it upon himself to care for the plants he discovered. Over time the plants become curious and begin to spread out. At first they stick to the railway and it becomes a beautiful walking garden. Eventually the entire city is transformed from dull and drab to a city filled with color and roof top gardens. So what does this have to do with the High Line in New York? 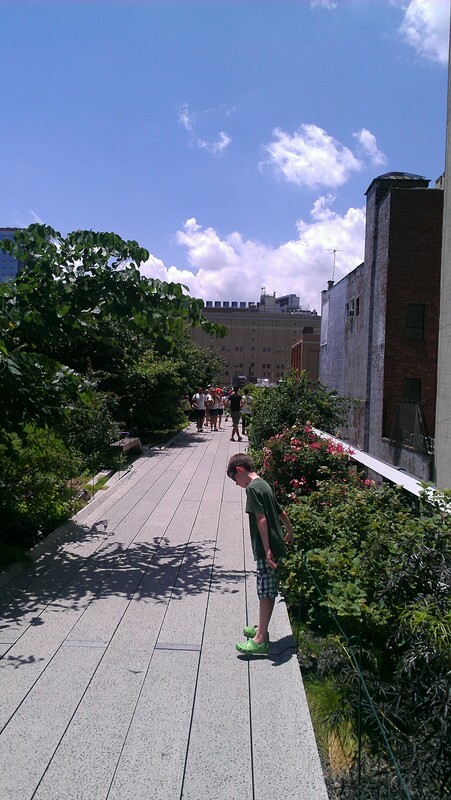 The High line is an elevated rail that has not been in use since 1980. It was transformed into a public walking garden that runs 1.45 miles. This is where Peter Brown got his inspiration for The Curious Garden. When you walk the High Line you can absolutely see why he wrote this book. The views of the city are great, but then add in the fact you are surrounded by wild flowers, evergreens, and other various perennials. All of a sudden you’re not in the city anymore, but in some kind of hybrid oasis. As you walk the rail and look at the buildings you can see how others in the city have become inspired and started their own roof top gardens. Inspiration can come from anywhere it doesn’t need to be something as spectacular as a mile long garden in the middle of a city. It can come from your own back yard, a word someone says or something you eat. You just need to recognize it and be ready when it hits. So if you are ever in New York City I highly recommend taking the time to visit the High Line. You won’t be disappointed and who knows what kind of inspiration you may receive. And as for the book, if you went out and bought it and still haven’t finished reading it then I am glad I didn’t wait for you. If you haven’t purchased it yet, what are you waiting for? Buy it, read it, and get your kids into gardening!